PANAJI: The king of fruits continues to be unpopular in Goa’s markets even though its price has dropped sharply since last month. The Mancurad, which sold for Rs 3,500 a dozen last month, is currently being sold for Rs 1,200 a dozen. Yet, locals are evading the golden fruit, waiting for its price to drop even further. 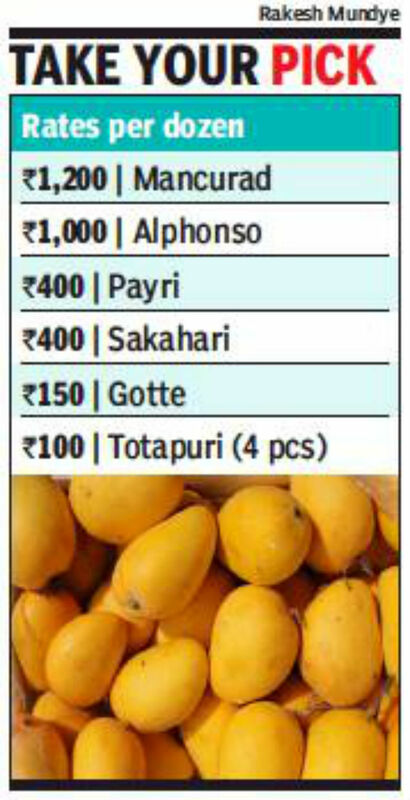 “Last month, a single Mancurad mango sold for Rs 300 and an Alphonso cost Rs 100, but Goa’s affluent stepped forward to buy them,” said fruit vendor Tabrez Mokashi. However, he says, locals are now evading the golden fruit since they’re aware of the annual trend of prices stabilising next month. As a result, some vendors are open to negotiating with customers, sometimes selling the fruit at Rs 800 a dozen. Locals are also apprehensive about the quality of mangoes currently available. “Mangoes imported from other states are sometimes hastily ripened using urea, baking powder and other fertilizers,” said Caranzalem resident B V Pai. “Fruits must be allowed to naturally ripen. A lot of people are not keen on buying mangoes now because of these issues,” he said.